Users who regularly have to write characters of different languages, be it in emails, spreadsheets or presentations, have usually a hard time adding those characters to their documents. This is definitely a thing of the past with the release of Easy Unicode Paster from Donation Coder Eric Wong. The project is target towards English speakers but can also be used by others (obviously) who need to access Unicode characters not supported in their keyboard setting. The Open-Source application comes with over 100 different Unicode character sets from Arabic overCherokee, Latin to Yijing Hexagram Symbols (whatever that is). The interface is activated with the keyboard shortcut CTRL 1 which is giving access to all the different character maps that are supported by the software program. Easy Unicode Paster remembers the last character set that has been used and presents its maps directly after bringing the application to the front. The program remembers the exact window size and position upon exit which means that it will show up in the exact same place during next program start. The sizes of the fonts and buttons can also be changed directly in the software program by right-clicking in the interface. Another excellent quality Donation Coder release. Is this really necessary? KDE comes with this built-in, and it can even sit in the system tray with with your X most used characters available (X is configurable by the user). Furthermore, Open Office comes with a Special Characters dialog built right into the software. If you didn’t notice, most people don’t use KDE, and don’t use crappy Open Office. No, I did not notice. I am aware that ‘most’ people do not use KDE, but the point that I was making is that this is a standard feature for at least some user environments. I would expect the default Windows environment would have this basic feature. Regarding Open Office, from my experience ‘most’ people do in fact use it. I do not know many people who still use MS Office or any other office suit. Before MSO 2007 I would have argued that document compatibility would be the only compelling reason to still use MSO. However, today even that is not a valid argument. You should try Easy Unicode Paster out before comparing it to other character maps out there because most others require to make your selection and click another button to insert or copy it to the clipboard and then require you to flip back to what you are working with to insert it. Easy Unicode Paster doesn’t require you to do this. It is just one click for one character insertion into what ever application currently has focus. There is no flipping back and forth between programs because it won’t take focus when used to insert a character. It is the easiest to use character map out there and I have tried the one in Open Office too. The problem with Open Office’s character map is that it is unusable for inserting many different unicode characters interspersed throughtout a regular document. 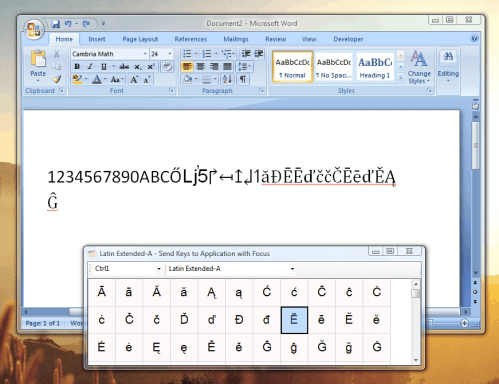 Easy Unicode Paster is much easier to use and is more productive. Sounds nice, Eric. I am a heavy user of the KDE character selector applet. Do you have a Linux version that I can try? If it’ better than the KDE built-in one then I’ll switch! I have taken a look at the KDE character selector applet at http://kcharmap.sourceforge.net/ and it suffers the same flaw that so many other character maps have. It requires you to select all your characters first and them copy them to the clipboard. Then, you have to paste them into your application. Why not just have one click for one character insertion into the application you are currently working with? It should be simple to insert a variety of unicode characters in a variety of places without excessive mouse clicks or paste commands. It also appears like it takes focus when used so you have to flip back and forth between your applications and KDE character selector. I am surprised that in this day and age new applications are not being written in Python or other cross-platform languages (java?). Seems a bit short-sighted, no offense intended. The KDE app (at least the panel version) does not steal focus. You are right that one must choose the characters beforehand with the KDE app, but I like that for this reason: I only have 12 special characters that I need to insert often (a few Greek letters plus infinity and degree signs, in engineering papers). With the KDE app I simply click on the character I want (always visible in the system tray) then middle click to paste that character where I want it. It is very intuitive, and takes up only the space that I need it too. If I need more characters, then I can easily add them. However, in the rare instance that I need a character not from my predefined characters, then I do need another application. For now, that ‘other application’ is either the official unicode website or wikipedia. Actually, .Net is designed to be cross platform if you have a framework for your OS. It’s just like Java but with better performance. With Java, you also need to have it’s runtime libraries installed before using it. Microsoft is increasingly using .Net for the new portions of Windows and is highly regarded by programmers. Even with cross platform languages, you still cannot do everything you want to with them because sometimes you need access to OS specific functions, like SendInput for Windows. Cross platform languages typically restrict what you can do so that they can ensure that code will run on all operating systems it supports. > if you have a framework for your OS. Yes, you can get a .NET framework for any OS you like, so long as you like Windows (apologies to Henry Ford). .NET is not cross platform no matter if that was one of the buzzwords MS threw at it. Mono is a decent project, but it is far from a drop-in .NET runtime environment. I am aware of the limitations of coding in OS-neutral languages, which is why I love Python so much. In Python one can access the OS API as well. But I won’t get on a soapbox here, this really isn’t the place for a silly enduser like me to start telling the software devs what tools to use or for which OS to code for! I wish you luck with Easy Unicode Paster and if one day I find that I’ve either drifted to a supported platform or that EUP has drifted to a platform that I use, I will be sure to give it a thorough workout and report my opinion to whoever is maintaining it at that time. Thanks! I am writing this in the hope that someone, who has the knowledge and the time would implement this for Windows and Linux. I found the most user friendly way to do this on the mac. I have a US Keyboard, but the mac offers you lots of keyboard layouts, just like other operating systems. There is nothing new so far. One of them is Turkish, but this is obviously for people who have a Turkish keyboard, so this is not what I am talking about. Additionally, there is an other layout called Turkish Unicode. This one works with similarities. E..g. when I want to get a u with dots on it like here (ü), all I need to do is to type ALT and u. No additional SW is required, no unicode knowledge is required, no mouse actions, no additional pop-up windows. Just the alt key. I guess there is no way to beat the simplicity of this for people without a keyboard specific to a language.